Fiber optic swimming pool lighting continues to attract many people today. In fact, fiber optic lights are among the most ideal lighting equipment for in-ground swimming pools. And, this is mainly attributed to their durability, efficiency and stylish appeal. Fiber optic lighting can provide a greater option for illuminating your swimming pool for enhanced visibility at night. Besides, they can also create a unique and elegant display across the home or establishment where the swimming pool is constructed. At Swimming Pool Singapore, we offer a wide selection of quality and affordable fiber optic swimming pool lighting solutions. Our fiber optic swimming pool lights are designed with unrivaled innovation to deliver the best illumination and ambience in every pool. And, we can always help you in obtaining the most suitable fiber optic lights for the particular type and size of swimming pool that you have and budget. Fiber optic swimming pool lights are quite powerful and, this enables them to always produce very bright light. As a result of this, they are a great way for improving visibility in the pool, making it easier for you to enjoy swimming even at night. Whether you use the light around the perimeter or under water, it can still deliver greater performance and illumination. Despite the brightness of fiber optic lights, they do not produce heat as experienced with other common bulbs and lights. This also makes them quite safer since they can never cause risks of burns even if the body comes into contact with them. Since fiber optic pool lights come in diverse wattage, you can always choose the devices based on the illumination level or kind of experience that you need. Despite the wattage that you choose, you will still be able to generate bright light to properly illuminate the swimming pool. Another benefit of fiber optic swimming pool lighting is, they offer greater flexibility in terms of application. Strands of fiber optic lights can be easily installed in various areas on your swimming pool. In fact, these lights can work perfectly around the swimming pool as well as under water without losing their effectiveness and appeal. Fiber optic lights are the most ideal option for areas where the material cannot be penetrated to allow for the fixing of lights. The fiber optic strands are very easy to work with, and can always be customized to work even in areas where most pool lights cannot work. Fiber optic swimming pool lights can be installed during the construction of a new pool, maintenance or upgrade of an existing one. These lights can be an easier and less-costly way of transforming the appeal of your swimming pool. Fiber optic lights are usually accorded different designs including, those that glow at full length, on the sides and also others only at the ends. As a result of this, they can also be used in illuminating certain features of the swimming pool like, waterfalls to create a unique centerpiece. 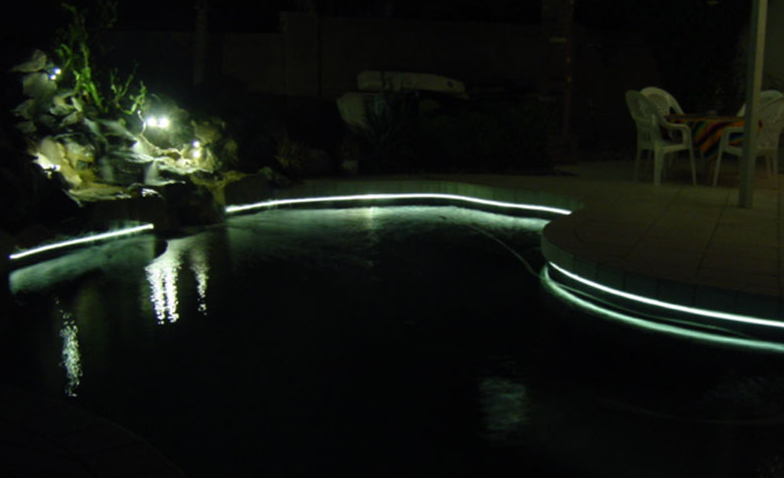 Similar to LED lighting, fiber optic swimming pool lighting can also be obtained a variety of color schemes. The most common color schemes include green, purple, amber, red, blue among others. This can go a long way in enhancing the beauty and general appeal of your swimming pool for a more luxurious feel. Besides, the colors of the fiber optic lights will also create a unique center of attraction in your home or business establishment. Depending on your needs, you can choose fiber optic swimming pool lights in different colors or simply get one that can simultaneously change its colors. On the other hand, you can also choose fiber optic lights in color schemes that can blend in perfectly with other elements in the space or garden. This can be a unique and cost-effective option for home beautification and improvements. Another aspect that has made fiber optic pool lights quite prominent today is their durability. If installed right and used appropriately, fiber optic swimming pool lights can last for quite a longer period of time without constant replacement or repairs. The lights are made from solid polymers, which are thick and strong. Besides, they are also enhanced with sturdy connectors and couplers for longevity. With fiber optic swimming pool lighting, you are also able to easily cut down on the costs of energy for running your swimming pool. These lights usually consume very little energy than common bulbs and tubes. Coupled with their durability, installing fiber optic lights on your swimming pool could be a great option for lower maintenance and operational costs of the facility. When thinking of buying fiber optic swimming pool lighting, Swimming Pool Singapore is the ultimate place to visit. Our company deals in the best quality products that guarantee unrivaled efficiency and affordability. We have professionals to assist you in choosing the most suitable fiber optic pool light for the particular size and type of swimming pool that you have. Whether you are constructing a new swimming pool or doing renovations on an existing one, we can always help you get the best. Our company also has a team of engineers with expertise and experience in a wide range of services to deliver professional installation of the lights. This means you do not have to go through the hassles of setting up the fiber optic lights on your own. We can conduct the best fiber optic lighting installation services customized to the particular swimming pool that you have. And, our company also has the most affordable rates for both the products and installation services so you are able to get the best fiber optic swimming pool lighting solutions for less.